I started the Underground Market in 2009 as a reaction to the high bar of entry that has been created to start a food business, something that I experienced personally. Starting in a house in the Mission with seven vendors and 150 eaters, the market has grown to feed over 50,000 people and help over 400 vendors get their start. As many of you have heard, the health department came to the last Underground Market on July 11th and served us a cease and desist letter, stating they no longer considered the market a private event. The market was able to function to this point because it was considered a private event (hence the market sign-ups). We organized it in this way following a suggestion by the health department. Everyone who walks through the door is a member who knows they are eating un-certified food , so technically the health department doesn't have to be involved. They have decided (apparently with pressure from the state level), that the market is no longer a private event, and can therefore not continue as it has. We have requested a meeting with the city attorney for a definition of what a private/public event is exactly, so we can determine where the line is, and continue running the market. This was not an unexpected event. We’ve known that it was only a matter of time until someone became upset about the popularity of the event. Because we’ve been expecting it doesn’t mean that we accept it. 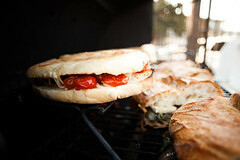 Over the last year and a half The Underground Market has grown into a supportive community of makers and eaters. We see that in the 30-50 new vendors that apply every month, bringing samples of foods they clearly poured their hearts into, and the thousands of people who walk through the door each month to eat that food. Our goal is to keep this momentum going. We would like to see the market continue to exist much as it has because we feel that it provides a necessary venue for people starting new food businesses. We’re interested in providing a space for entrepreneurs who for a myriad of reasons are not able to abide by the regulations put in place. The regulations, upfront costs, red tape, and lack of clarity in procedures all too often stop amazing food from ever being eaten. The market is used in different ways by different people. Some are home cooks that have always wanted to sell, but for various reasons have not been able. Cocotutti is a prime example. She sold her first chocolates at the market over a year ago, and has since won national awards, moved into a commercial kitchen, and is approaching markets to stock her goods. KitchenSidecar worked at a bio consulting job, with a food blog on the side, before she found the market. Now she cooks full-time, caters, holds her own dinners, and collaborates on a Vietnamese pop-up restaurant called Rice Paper Scissors with another vendor, Little Knock. Nosh This was working as an architect before he was laid off and turned to the world of candy. Following his recent appearances in the New York Times, his wholesale accounts have exploded, he has moved into a commercial kitchen, and is working to make “Bacon Crack” a household name. These are a few examples of people whose business, and some would say lives, have been changed because of their exposure at the market. People who have been able to earn money for themselves instead of populating the unemployment rolls. People who are contributing to the local economy while at the same time expanding the local food community. We want the Underground Market to be a space for food entrepreneurs to get started on a small scale. And we want to continue to offer them more resources to move forward. We have seen the need for some time to have a space where vendors can produce their wares commercially. A space where we can hold classes on food safety/business, have commercial kitchen space for vendor use, retail space for them to sell, and café space with rotating chefs for them to cook. This space will be a hub, a place where people can come together around the wealth of food being produced in our city. We are starting work on looking for a space/getting details together on the project, and will send more information out soon. On a personal note, I want to say that I really appreciate all the support people have shown. From emails from friends to tweets from strangers, you have all shown that you think the market is an important event and that you want it to continue. This shutdown is an opportunity to find a workable model that can help not only The Underground Market in SF, but similar markets all over the country. The precedent we set here will ripple across the country. It will effect not only San Francisco vendors, but vendors nationwide. From cottage food laws to street food, we’ve seen an explosion of opportunity for small entrepreneur food businesses pop up over the last several years. We will continue to move forward toward our goal of keeping the market open, and our struggle can be an opportunity to find yet another way to help this movement grow. We want to hear what you think, so if you have any other ideas, questions, or suggestions, please email iso@foragesf.com. 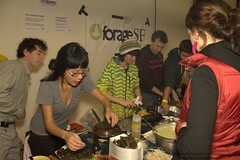 To stay up to date on what’s happening, follow our blog at foragesf.com/blog. Jilli Ice Cream and Soda - Ice cream. Soda. Happiness. 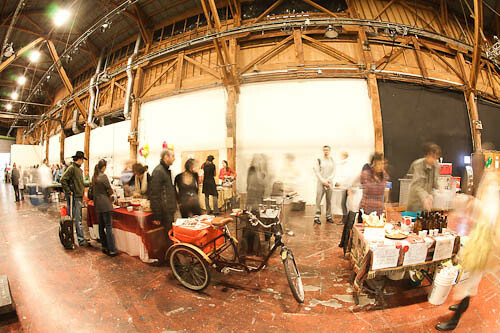 The next SF Underground Market will be a happening Saturday January 15th, as a collaboration with PublicWorksSF. Basically, we're bringing the food, and they're bringing the music. Something that's always been a part of the market, but until now has not had the focus we'd like. This is going to be a lot like the markets you've come to know and love, but we're upping the ante on the party in the later evening. We are still going to have a full market, starting at 11am, but instead of ending at midnight, we'll be going until 2am with more drinks, more food, and more music. All of our favorite new and returning vendors will be there making delicious food I'm really excited about this, so come out, eat some food, drink some drinks, and support local food. A year has passed since the first SF Underground Market. 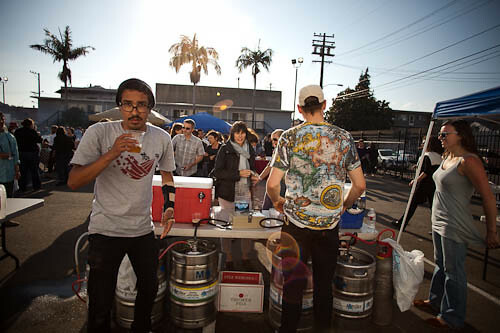 In one year we moved from a small house in the Mission to various warehouses, and eventually to a 17,000 sq ft. event space called SomArts. 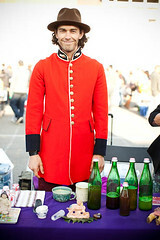 We started out with a list of 7 vendors to over 500, from attendance of 150 to well over 2,500. The idea has spread, and now there are markets in Boise Idaho, Amsterdam, London, Colorado, Marin, and right here in SF. Many of our vendors have gone from being people with passion, cooking for their friends on the weekends, to full time Artisan producers, selling at stores and farmers markets throughout the area. The market has morphed from a one off event into a semi-monthly vendor incubator. One year ago we threw the first SF Underground Market, in a small house on Bryant St. Despite being paid a visit by the health department, the market was a success (read my post about that here). Throughout the year I’ve found that there are an abundance of home cooks out there producing amazing food. People with the skills to go pro, the problem is a lot of people don’t think they can. For whatever reason; financial, emotional, they don’t do it. There are many hurdles to getting into traditional markets. Putting yourself on a waiting list for a vendor spot at a farmers market (often a year waiting list, and you need to already be producing to get on the waiting list), then investing $2,000 to make a batch of jam that you’re not sure will sell, and then trying to make a profit, all the while using organic ingredients, and this all on a salary that is probably just covering your expenses while working a full time job, makes this a tough proposition. Again, a lot of people do it. But I believe it doesn’t have to be that way, and it seems others agree. We certainly hit a vein of some sort. People love making stuff; be it “Bacon Chocolate Crack” (Nosh This), Vietnamese Crepes (Little Knock), or Jalapeno Jam (Inna Jam). 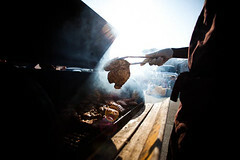 And perhaps just as important, people like to eat what their neighbors are making. Instead of picking it up at Whole Foods, you get to talk to the producer, and learn through them how your food was produced. 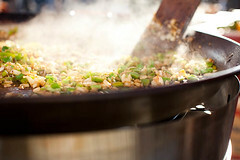 What is most interesting about the wares at the market is not so much what they are, but how they were made. They were created by a person, rather then a machine-assisted assembly line. This is often a single person that decided that instead of having a Desperate Housewives marathon, they would get off the couch and make the thing they have been wanting to make for years. The market is a room full of inspiration. Many of the vendors we have were first attendees who were then inspired by what they saw and decided they could do it too. This is the point of the market. The sales are good. People need to pay the rent, but more importantly, people need to be shown that they can do the thing they’ve always wanted to do. Be it making pickles, roasting whole pigs, making homemade kimchi hotdogs, or Vietnamese crepes. It is most inspiring to see such a wide range of people become vendors. The past year has been full of lessons, such as the finer points of room capacity, how to deal with long lines, trash separation, and what pulling 100,000 watts of electricity looks like. I have learned that you can in fact have too many cupcakes, and that pork belly buns, although delicious and popular, don’t turn a profit. I have learned that people don’t really want to carry home bags full of jam while drinking at 10pm (hence the day market), and that if you roast a whole pig, people will come. It has been a surprisingly good year. We grew something out of nothing. In the next year we will be focusing more on the incubator aspect of the market. We are working on providing more vendor support, by organizing a group of professionals that will help the vendors figure out what it means to really be in business; from logo and website design to legal and financial help. The market is not a destination for an established business, but a stepping stone to realizing one’s passions and potentials, while providing the opportunities and tools to do it. I’ve recently realized that up until now, most vendors have had to figure out what it means to start a food business from the ground up on their own, and I would like to change that. Most businesses are started without the support they need to succeed. What the Underground Market means to be is a community of people helping each other to change that. If you’re reading this, you are probably involved in the market in some way, as a customer or a vendor. We’d love to hear about your experiences with the market. What’s good about the market and what would you like to see happen?